Are you ready to become a master of guerrilla marketing and joint ventures, the combined type of smarter marketing necessary for true entrepreneurial success worldwide in any economy and any marketplace. 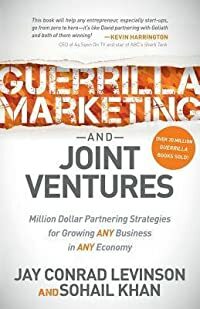 "Guerrilla Marketing and Joint Ventures" explains step-by-step how entrepreneurs can use smarter marketing and joint ventures to generate maximum profits from minimum investments. Put another way, applying what you are about to learn can help make your business grow very quickly for low or even zero-cost and real-life case studies (including the author s own experience of going from zero to 4 million customers in 30 days) will also show you how joint ventures can help an individual entrepreneur make millions in a very short space of time."